For some web conferences, using a central office speakerphone might be all you need. However, especially in noisier office environments the use of a headset with microphone that plugs into your phone or computer if using VoIP, provides better audio quality along with some other great benefits. These benefits include but are not limited to being able to keep your conversation private, while also keeping unncessary sounds like a speakerphone echo effect at bay. When planning and scheduling your next event, remember to set your webinar so that reminder emails for all registrants are sent on the same day of the webinar and also 30 minutes before the webinar is scheduled to begin. By doing so, you can potentially increase the attendance rate, as you keep your webinar event on your audience's minds. When preparing for a web conference, it is suggested that the presenter utilize two computers for a practice session. By doing so, the presenter will be able to log in on one computer as the moderator and on another computer as a participant. As the presenter works his/her way through the presentation, they can look at the participant computer to see what the particpants would be seeing for the live session. If you do not have two computers available to you, try using a dual monitor display and two different web browsers to achieve a similar result. When using webcams during your web conference make sure that you adjust the positioning for least possible angle between your camera and your eyes' gaze. Most often, to reduce this gaze angle you would place the webcam near your monitor by the area of the screen you watch the most often. In most common web conferencing scenarios, this would be on top of your monitor, either centered or slightly off to the left or right. When conducting a web confenrence, it can be easy to get caught up when you're attempting to summarize the presentation. As such, the important thing about presentations is to make sure to try and kreep them succinct. If you can’t summarize your main point in 15 words, you need to try again. This short summary will keep you from boring your attendees. When conducting a web conference, try to put an additional person in the room with the presenter. This way, the conversation can be directed at an individual rather than into a microphone or the computer. Not only will this aid in the presentation sounding much more natural and captivating for the listeners, but it will also help to put the presenter more at ease. Often times when conducting a web conference, you will be using bandwidth intensive features such as the webcam or screensharing. For this reason, we recommend the use of a wired connection. While WiFi may seem like a good option for a web conference session, it has its negatives. The most common issues associated with being on WiFi for a web conference are related to connection quality. With a WiFi connection you will be more prone to spotty session quality and transmission speed. It is important to remember that when conducting a web conference, you should make sure not to present too quickly. More specifically, regardless of how fast your work or home internet connection is, your participants will also experience some level of difference between what you see on the screen and what they are seeing. To combat these latency issues, try working around 50% slower than you would in an in-person meeting. Regardless of whether you're connecting to your web conference from a your office, home or on the road, it is very important to take into account the positioning of your webcam. For example, it may be that your work desk setup is slightly better suited for multitasking projects than for conferencing and will need to be tweaked. Make sure to preview your own webcam output to make sure that you're at just the right distance from the camera so that you do not appear too relaxed or stiff. Lastly, avoid pointing the camera at a direct light source such as a window or lamp, as this can cause the webcam to overcompensate and whiteout the video. It is important to remember that the bandwidth of your Internet Service Provider determines the overall quality of the web conference communication. As such, make sure to exit from your email client, instant messaging service, extra browser tabs and anything else that accesses the Internet and could potentially slow your connection. Next, try to use a computer with a wired connection instead of wireless. This will help to ensure that you are not losing valuable bandwidth. Lastly, as with most offices you likely share your web access with coworkers. Politely ask them if they could minimize online use (especially donwloading or transferring files) during the web conference. In order to avoid audio feedback during your web conference, adjust the position of your microphone and headphones/speakers to get the best sound. Ensure that your speakers are far enough from your microphone, to prevent any audio looping. If you are using a headset mic and earphones, ensure they aren't blocking your face, as this will help prevent muffled sounds. Furthermore, try your best to avoid moving things around or shuffling through papers while you or others are speaking. Lastly, turn off TV's, radios and other electornics to further eliminate background noise. When you throw a long, involved question at your audience from the start, it is going to take them much longer to become familiar with the chat feature. Instead, ask something simple and short at the beginning of your web conference, such as their names or where they are from. This allows your audience to find the chat box, learn how to use it and practice responding before you require them to create a longer, more involved answer. Lastly, you should also recognize at least a few of the responses verbally so you can show your audience you are really reading what they write. If you decide to utilize a webcam during your web conference, make sure to maintain frequent eye contact with the camera. By doing so, you will allow your remote audience to feel more like a part of the meeting, as it seems as if you are now talking directly to them. If you are not using a webcam, some services allow you to upload a JPEG of yourself. While your speaker photo may not update like video, it will still help the audience connect with you, while using less bandwidth. It is highly recommended that you, as a host, plan on providing a brief introduction during the beginning of the web conference. The reason for this is that it is a good time to not only introduce yourself, but also others who may be presenting during the web conference. Lastly, this is an ideal time to provide any additional information to your participants such as what you expect out of them and also let them know how to go about asking questions during the web conference. Many web conferencing services have advanced features like screen sharing available. If you are planning on sharing your screen with the group, make sure that you enable the screen sharing feature prior to the start of your scheduled conference time. This helps to save time and also prevents others from having to wait during the meeting. Furthermore, it is suggested that you lower your computer’s screen resolution to at least 1024 x 768. This will help to reduce the data you are sending and as such, will help those viewers that have lower quality monitors see everything clearly. If you are using web conferencing in order to promote a company, service or product, a strong call to action that motivates your readers to want what you are offering is strongly recomended. By including a strong call to action, you web conference will make your listeners feel the urgency in why they need to purchase or take a closer look at your products and services. Furthermore, this will also highlight the importance and overall value that your subject offers. Lastly, make sure your message is clear enough that your audience understands what you are trying to convey. Often times when a presenter continually refers to an outline, a particular diagram or piece of information that the audience can’t see or participate in this, the situation causes confusion and can often times lead to increased levels of frustration for all. This often occurs when the information was earlier in the presentation and is being referred back to. When you have more than several people on a web conference, it is easy for multiple people to want to share their ideas, push slides and speak at the same time. However, when you have too many people who have presenter features such as controlling slides and annotation tools, a sense of disorganization and chaos can quickly overcome your meeting. For this reason, if your web conference requires the use of several presenters make sure to plan the flow of the meeting and coordinate roles prior to your event start time. Remember, by keeping control and limiting the number of presenters, you are reducing the chance of unauthorized use of a web conferencing features and disruptions within the meeting. Running late happens, but do your best not to be late for any web conference meetings. It is always best to arrive about five to 10 minutes early so you can become comfortable with the web conferencing software being utilized. This also allows the meeting to start on time and avoids the distraction of late entrants. Another recommendation is to send an “I’m here in case you want to join early” email to the entire attendee list. Make sure to include all the log-in details and instructions again, to make the information easily available to your participants. Take the time to schedule a mock web conference before your live conference where you can practice your presentation before doing it live. This will give you a chance to become familiar with the materials you are presenting as well as the location of files you plan to show to your audience. Practicing will also give you more confidence when you are live in front of your participants. 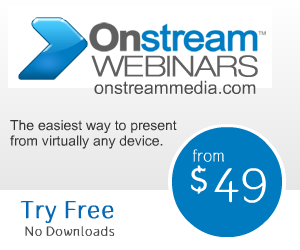 Some businesses set high goals for their webinars. While there’s nothing wrong with wanting a large turnout, you need to have realistic expectations to avoid disappointment. Understanding your expectations will help you measure your success against the goals you set for the webinar. When you have realistic expectations for your webinar, you will have an easier time with the follow-up plan. Remember, webinars are more about building relationships and generating interest than creating a massive explosion in your sales. One of the most important webinar best practices is to put out content that relates to your webinar to attract attention to it. This content should cover the same topics and offer insight and create intrigue in your readers. The goal is to push your readers to your landing page so they can sign up for your webinar. This particular web conferencing tip applies to you regardless if you're a moderator or a participant. When conducting or participating in a web conference, your location and environment are key. A loud environment will be distracting for all that are attending your web conference. As such, try to locate a room with a door and make sure the door remains closed for the duration of your web conference. In addition, it is suggested that you imagine that your office the stage for your meeting and that your participants make up the audience which is in the room. Make sure you don't say anything, do, or wear anything that you wouldn't in real life. However, it can be difficult to find a quiet spot in an office environment from time to time. If you find yourself in this situation or are working in a cubicle, put a sign up saying that you are participating in a web conference, as this will help make those around you more aware of their noise levels. Social media has become an important tool in webinar promotion. Different social media sites will require a different strategy and approach. Email blasts can be an effective method of webinar promotion, but it needs to be done correctly. The truth is not everyone in your email list will be interested in every event you hold. Promoting best practices dictate you should create separate lists of email addresses that are likely to be interested in certain topics for webinars so you can better reach out to the right people each time. If you don’t know what this best practice is, you may find that people quickly become uninterested in your presentation. As such, what this tip states is that your presentation shouldn’t include more than 10 slides, should last no more than 20 minutes and should include font that is at least 30 points. Keeping things short, simple and easy to read will better engage your attendees. It is important for a webinar to have proper and measurable objectives, in order to ensure it attracts the right types of attendees. By having objectives in place, you will be able to better measure your success and return on investment (ROI). In too many webinars, businesses don’t give enough thought to the objective; they simply throw it in as an afterthought. However, if you don’t have proper objectives, you can’t see what was right and wrong with your webinar and will not be able to make improvements.